With the new Games Workshop paints out, I decided to go through and share a few resources I use when it comes to making sure my paints match up. To be honest, I'm starting a new Novamarine force and I'm tempted to go out and buy the specific paints I need for the army so that I'll have matches later on down the line. I might do it for the main colors only and just use what I already have for the smaller spot colors. It would mean a bit of money on the front end, but I think it might save me some headaches later on if I go to add to the army or want to change something next year. Not that GW is going to change the paints again that soon, but I don't want to deal with the issue later if I can prevent it now. That being said, I've got a few basic things here that might help folks out. These are not my resources, they been collected from others and I'm just sharing them here. 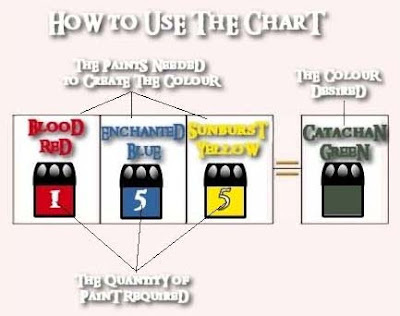 This is the PDF that GW put out with little swatches of each color, the names of the old paint and the new paint next to each one. Nothing new here and easily found on their site I'm sure. This one comes from DakkaDakka and is a fairly in depth conversion chart for a number of paint lines. It includes the new GW colors, the old GW colors, Vallejo and a few other paint lines. Very helpful for someone like me who uses lots of different brands and wants an idea of what would be similar across a few different paint ranges. I've saved it as a huge jpeg image you can download onto your computer and open up whenever you have the need to cross reference any color/paint range. Go to the living paint chart document on DakkaDaka here. While this one is cool, it may be a bit tougher to do now that the GW paint line has changed. If you do find yourself needing an older, obscure color and have access to the 5 basic colors outlined here, you "should" be able to make it or at least something very close to get by in a pinch. I've saved it as a huge jpeg image you can download onto your computer and open up whenever you have the need to try and recreate an "old school" GW color. I found this information on Nesbet Miniatures and he's sharing it from elsewhere as well. While I haven't had the chance to use the new paints yet myself, I suspect they'll have their good and bad aspects we'll all discover as time goes on. Just like the previous range, we'll have our "good" and "bad" colors, those that are problematic and those that make things a breeze. I'm excited the range has increased and there are more colors to pick from, but then again, I already use lots of colors from any number of ranges so I don't have to mix anything. If there's anything I hate, it's having to mix colors to get the one shade or hue I really want. Lascannons and Lances did a little test to see how well they could replicate this and it didn't turn out that well using the formulas provided. I think the important thing here is to make sure you try these things out before you go repainting your prized unit. A handy online paint line conversion program. Lots of different paint lines in here. Seems like most of the scale model paints are listed. And last but not least, how I go about scouting around for color matches. According to this Review http://lascannonslances.blogspot.de/2011/11/myth-busted-citadel-colour-mixing.html the Citadel color mixing chart seems to be wrong. Cool post Ron, I've got to say I'm seriously considering getting the whole set of the new GW paints after using some. It's horrendously expensive, £333 in the uk which is almost half a months wages for me! It must be very expensive else where too. I've found a website that can do it for £266. I'll have to get selling stuff on eBay. Wow, Ron, that post is extremely helpful, thanks! Even though I am not a particularly good painter, I am quite nervous at the prospect of having to adjust my well trusted painting recipes again, so I guess this will help a lot. The truly frustrating thing is that I had just settled into the last incarnation of the Citadel paint range, having only come back to the hobby in 2010 and discovering some of my favourite colours (I am looking at you, Scaly Green!) were gone. Then again, adapting my World Eaters recipe cannot possibly be that hard? It's just red, bronze and silver. Right? RIGHT? Anyway, thanks again! I would love to hear if anyone here was already able to get some firsthand impressions of the new paints! 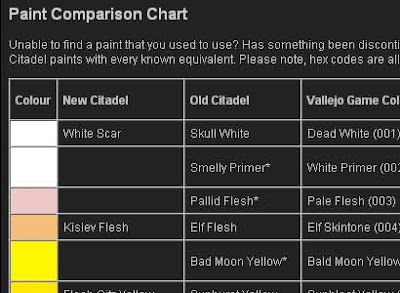 While I'm an unrepentant Vallejo fan, and use Model Color for everything I do (with a smattering of Gunze, especially the primers and lacquers), there are some Citadel paints I find really useful. Thanks for the post - the charts will prove very useful. What I went in the store to find out really, was if all my old colours were going to be anywhere near the same. I am half way through two of my armies (Eldar and Nids) and still expanding on my Necrons. They didn't have the new equivalent of my Liche Purple, but they did have the new equivalent of Mordian blue, Macragge blue. Sadly, Maggragge blue is a totally difference colour to the old version, and is was worrying! I too enjoyed the drys. If your a necron player the necron silver dry is great. I'm sceptical of how much texture paint you will need for the bases though. Could end up going though a lot of pots. Haarspalta: Thanks for the link, it's really interesting to see just how far off the color mixes are in the experiment. ieuan: I don't know if could afford the whole new range, but I'm seriously considering getting the few colors I do need to paint my new force. FourEyedMonster and KrautScientist: Thanks guys! Marcin: Glad it helps, I'd say to use them, but be cautious of them. Experimenting first is the only way to know for sure before you repaint a prized model. IDICBeer: That seems to be the trend... the new paints are good, but they don't match. Maybe close in some case, but not close enough for folks to make the transition nice and smooth. Great post. Nice to have everything laid out on one page. Sean: You're welcome, just make sure to test any paint combinations or substituions first! A question for those who are used to working with Vallejo colours (I've only used them from time to time): Are there fairly close counterparts to the now "old" GW range in the Vallejo range? 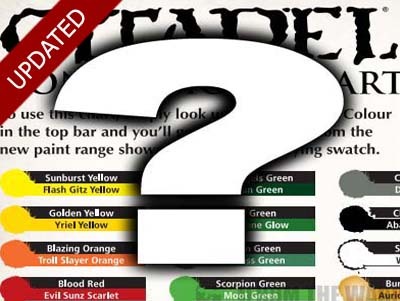 Would it be possible to still use Vallejo colours as an emergency plan if it turns out it's hard to reproduce existing colours with GW's new range? @ KrautScientist: If you can't find a paint in Vallejo color range - and I mean its entirety, from Game Color to Panzer Aces - then it probably means the color does not exist. Still, if I recall correctly - I use Model Color, not Game Color - the latter range had a conversion chart (available on AV website). I'm pretty sure you'll find a lot of close matches. Here is a decent tool for finding the same paint within different ranges. I think it is mainly intended for vallejo paints but it works across many of the major ranges: http://www.paint4models.com/index.html. If you click launch it will open a program that allows you to search by colour name or number and gives the equivalent values in the other paint ranges you select. Nice post, this will be most helpful in the future. I must say, I am looking forward to trying some of the new paints and see if it is worth the uproar. But as for now, I am going to keep buying the old paints while they are still out. Gotta get a new bottle of Tin Bitz! Great post! After trying the new paints I want them all but $645 CAD and all I get is the paints and an army case? I guess even the mighty GW is feeling the economic downturn and offering less for more. Even so I still want them - I am the definition of a paint addict. "Sadly, Maggragge blue is a totally difference colour to the old version, and is was worrying!" Uh oh. I use Mordian for all my Ultramarines, so it's a good thing I bought two new bottles a short while ago. How different is Macragge Blue from Mordian? Can it be made to look like the old color? Still haven't had a chance to try any of these as my area seems to be a deadzone. No older paints and no new paints in stock. Glad I'm not in need of any right now. When we do get these in stock I'll keep your article on hand.